Office hours are 08:00 till 16:00 (Only during the week). Situated on the scenic Cape South - Eastern Cape. It lies between the coastal villages of Aston Bay & Paradise Beach, approximately 5km south of Jeffreys Bay, along the N2. The nature reserves comprises of an area of about 66ha at the confluence of the Seekoei & Swart Rivers, where it forms an estuary. The bulk of the reserve is only accessible by way of a small pontoon. Large populations of birds also frequent the estuary. This nature reserve lies between the winter & summer rainfall areas. The average temperature is 17 degrees & the avarage rainfall is 490mm. There is no clear wet or dry season, although most of the rain falls in spring & autumn. The weather can be unpredictable with some warm days in winter & some cold days in summer. The nature reserve is mainly Kaffrarian Thicket which consists of non-succulent subtropical transitional thicket communities. It is a tall, closed, large leaved ( semi succulent) shrub land with ouy- layers in rivers & coastal foreland. The most common trees are ghwarrie, Boer boon, milkwood, sage wood, bitou & aloes. There are also patches of coastal fynbos with Erica, PAsserine & Metalasia species. Bushbuck, grysbok, blue duiker, bush pig, porcupine, caracal, yellow & grey mongoose & large spotted genet are some of the species that occur. You are almost certain to see an ungulate tortoise or two. Fish Eagles may be heard calling & flamingoes may be seen if the conditions are right. Thousands of red knobbed coots also nest on the lagoon. 120 Different bird species have so far been identified. There is a 3km hiking trail that can be reached by crossing the river or pontoon. 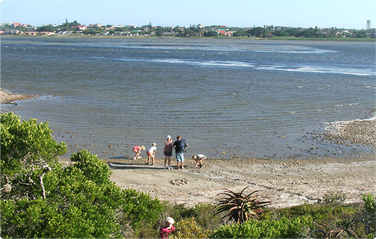 A short 1km hike runs through the northern section of the reserve & passes thed bird hide where birds can be viewed from the bank of the estuary. A braai place in the form a lapa is available for organised groups. Penguins can be seen at the Penguin Rehab Centre, where they recover after treatment from pollution & exhaustion. No fishing, canoes or boats are allowed on the estuary or in the nature reserve. No dogs are allowed & no animals may be disturbed or plants may be removed. No fires. For more information on the Seekoei Nature Reserve and the hiking trails contact Henie Swanevelder on 042 292 0339/083 406 3159.